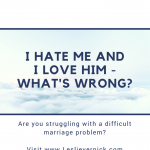 I Hate Me And I Love Him – What’s Wrong? I’ve Been Hit, Cheated On, And I Asked Him Those Three Questions. Now What? Help! I’m Filled with Anger and Resentment! Am I Manipulative and Controlling? 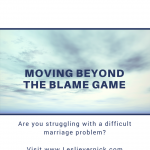 How do explain my ex-husband’s behavior to our kids without making him look bad?